Hi guys! It has been HOTTTT and so humid here this week – who else is counting the days until fall?! This weather makes baby walks and outdoorsy adventures a lot tougher, that’s for sure! Sidenote – Riese is in a phase now where she always tries to pull off her hats. 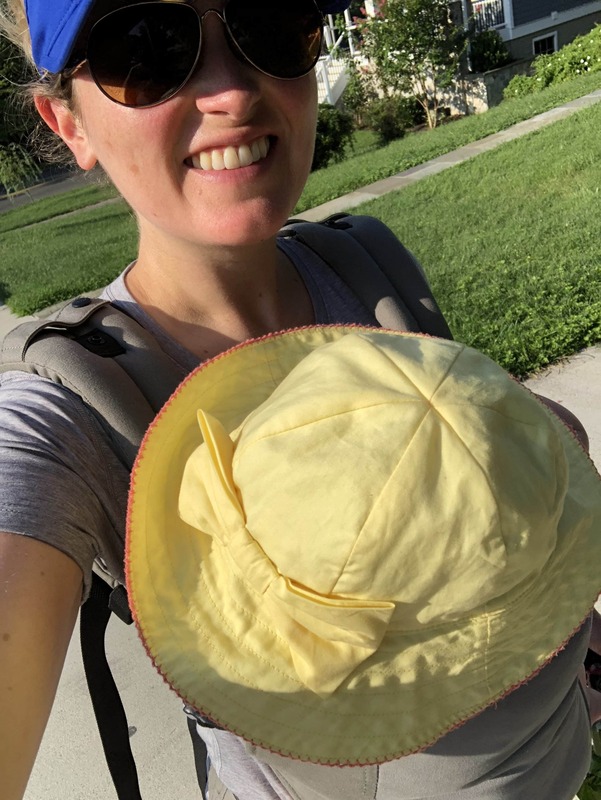 Anyone have suggestions for kinds of hats that are harder for them to take off, or in general how to keep hats on babies?! Once her hair fills in a bit it won’t matter so much but for now I don’t want her head to get burned! She outgrew our favorite bonnet, but I wonder if I got a new one of those if that would be harder for her to take off… hard to tell. Anyway – we had a fun mommy day yesterday filled with play dates. For lunch in between I had some leftover steak and strawberry salad with quinoa – recipe coming in a couple weeks! As for dinner, I got Riese to bed while Matt threw together a simple salmon feast for us. 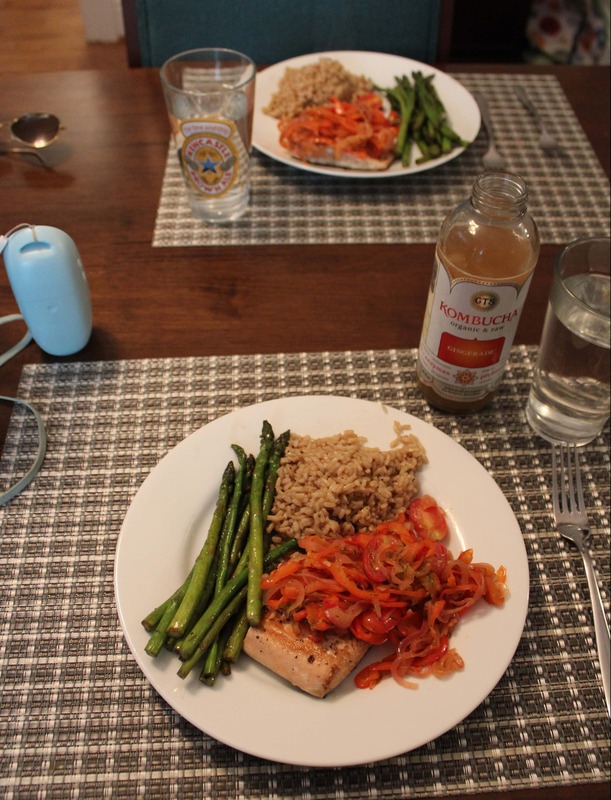 It was pan seared salmon (just in some oil with salt + pepper), plus sauteed asparagus (in a pan with some olive oil and minced garlic), and sauteed peppers, tomatoes and onions – also cooked in a pan with some garlic and olive oil. Plus instant brown rice! Easy and yummy. This would also have been a good sheet pan dinner – if you want more ideas, check out my Mix + Match Sheet Pan Dinners post! As for this morning, I was out early for a solo yoga class. 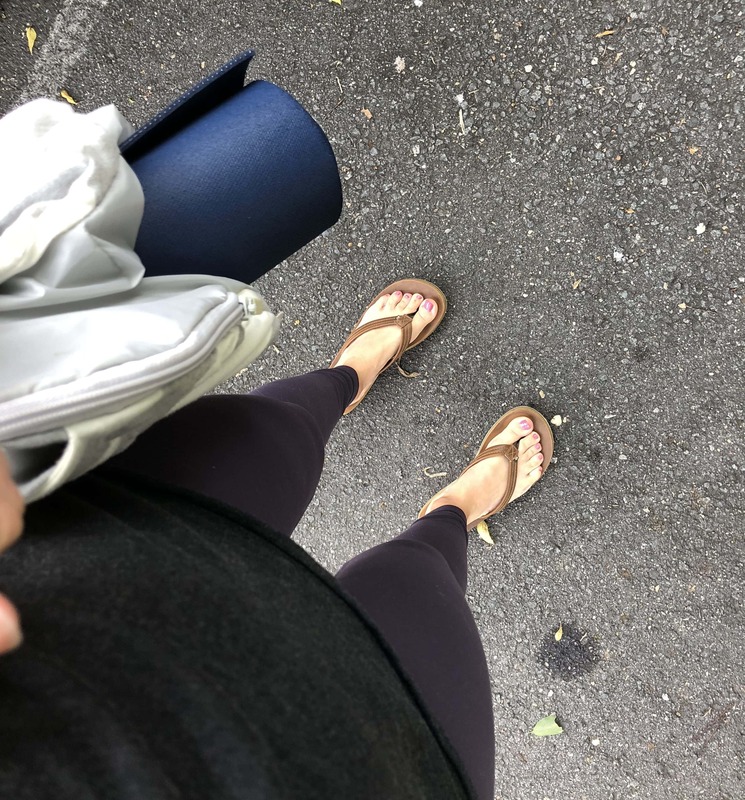 I’ve been in a good routine recently of going to yoga twice per week – I go in the early mornings on weekdays after feeding Riese and getting her back down. My body feels so tight and banged up lately from lots of walks, baby carrying, etc., and more intense forms of exercise haven’t felt as good. (I’m sure the heat has something to do with this, especially related to running.) Yoga seems to be helping, though, both physically and mentally! I’ve noticed a difference with my back in particular – it was bothering me for awhile, especially when babywearing, and more consistent yoga seems to have really helped. Hooray! Definitely going to keep it up. And now, I’m off to tackle the rest of this workday. Have a good one, friends! What form of fitness are you loving lately? It definitely changes by the season for me… I’m sure once the weather gets nice I’ll want to be out enjoying it first thing in the mornings vs. inside at a studio, but we’ll see! Evening walks and Barre3! Yoga is also so enjoyable and really helps my mind and body to relax. That salmon meal looks so tasty! Ugh this heat and humidity is beyond unpleasant! Even at the gym I’ve had trouble running because the ac can’t handle the humidity and I don’t feel that same energy so I’ve been a lot of arc trainer, squats and some long dog walks in the morning and at night. I am more into doing classes/spinning in the winter months when I have to be inside. Fingers crossed for cooler weather soon – and way to go making it work in the meantime! Bah, this heat!! I just got a new bicycle, and I just want to ride it! I am coming to peace with being completely sweaty all the time. I’m inspired by your yoga; I know that I should be more consistent. A bike ride right now would feel like a blow dryer to the face… yikes! Although at least there’s a little breeze haha. I love Twinklebelle hats. They have a toggle that keeps them in place. They’re on Amazon! Sweet I’ll check those out now. Thanks! This is probably a weird question, but how many pans did Matt use to make that dinner? Is it a separate pan each for the salmon, asparagus, and peppers, tomatoes & onions? Or does he rotate them through somehow? Just curious! It looks amazing. Not weird at all! I think he used two pans – one for the veggies and one for the salmon! I’ve really been enjoying long bike rides lately! 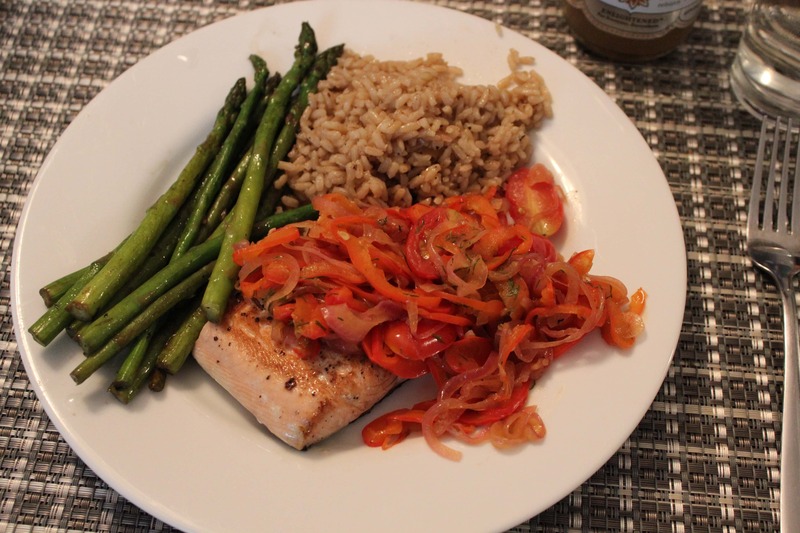 And love the idea of serving the salmon with peppers, tomatoes, and onions! I am a fellow dietitian so I feel like we have a lot in common, but you are certainly outdoing me on the workout front! I am seriously impressed and inspired by your dedication! I have had a hard time getting back into fitness after my somewhat challenging pregnancy. I do find that yoga has been helping me as well but that’s about all I’m doing these days. Keep up the good work mama!! It’s all about doing what feels best for you! I’ve had a hard time getting back into intense exercise – more gentle stuff definitely feels better for me still and that’s okay! I’m thinking once Riese weans it may be easier – I hear from friends who say their energy levels came up a bit after they were done breastfeeding. We will see! Cycling when the heat/humidity are not too bad! Well done on getting to yoga!